The BBC faces accusations of anti-independence bias after its political editor, Nick Robinson, produced a report that wrongly claimed Alex Salmond had ignored his question during a heated press conference. Calling into question the impartiality of the publicly-owned broadcaster, the veteran BBC correspondent edited out Salmond’s lengthy answer, in which the First Minister claimed the BBC had skewed facts and colluded with the Treasury to undermine the “Yes” campaign. 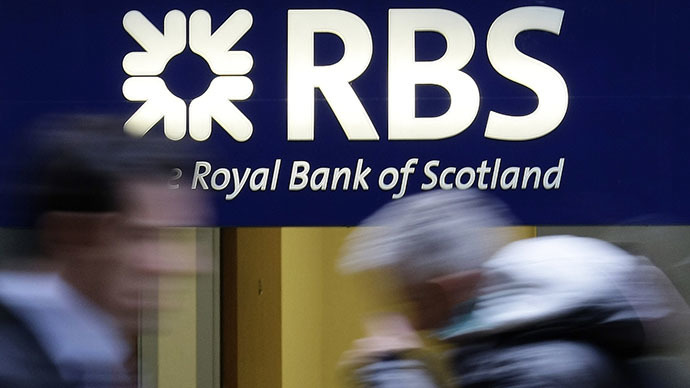 The exchange between Robinson and Salmond came after the BBC reported that a UK Treasury source said the Royal Bank of Scotland (RBS) would move its headquarters to London if Scots voted for independence. At the press conference, Robinson asked Salmond how Scottish taxpayers would make up the loss of tax revenue. What is not shown in Robinson’s report is Salmond’s reply and the heated exchange that followed. In his reply, Salmond insisted that the economic significance of RBS, Lloyds Banking Group, Tesco Bank, TSB and Clydesdale Bank seeking to re-domicile to London would be minimal, as only banks’ “brass plates” would be moving, while jobs in Scotland would remain secure. When Salmond attempted to move onto the next questioner, Robinson repeatedly challenged him to answer questions about the banks’ warnings. The First Minister then went on the attack, calling for a leaks inquiry into who from the Treasury briefed the BBC about the RBS announcement. He called it a matter of “extraordinary gravity” and said he was writing to the head of the British civil service to demand an investigation. “I know the BBC in its impartial role as a public sector broadcaster will give full cooperation to that investigation,” Salmond said pointedly. 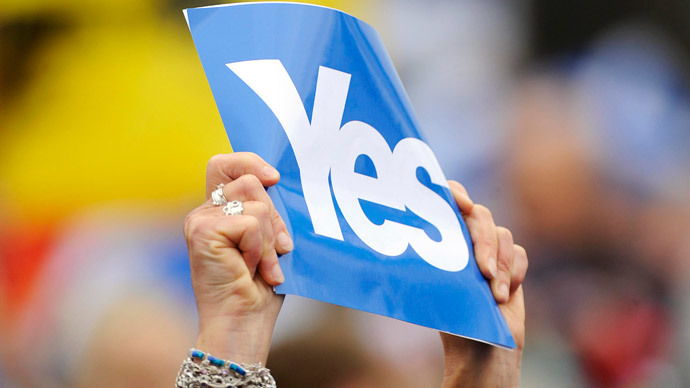 He added: “This has been a lively campaign across Scotland with heckling at many meetings across Scotland. 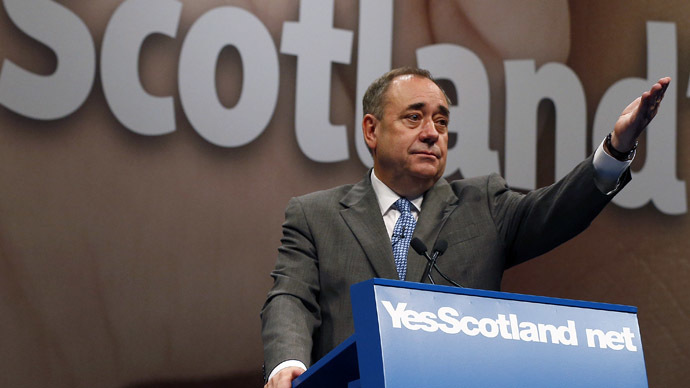 This is the first opportunity the BBC have had to heckle at a meeting,” Salmond said, laughing. 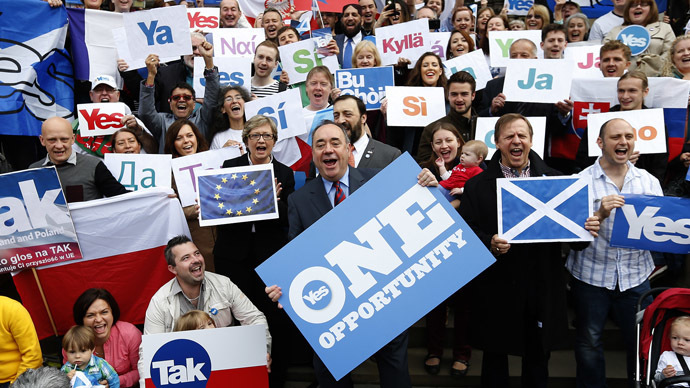 The exchange took place during a press conference held in Edinburgh for international journalists covering the independence referendum. 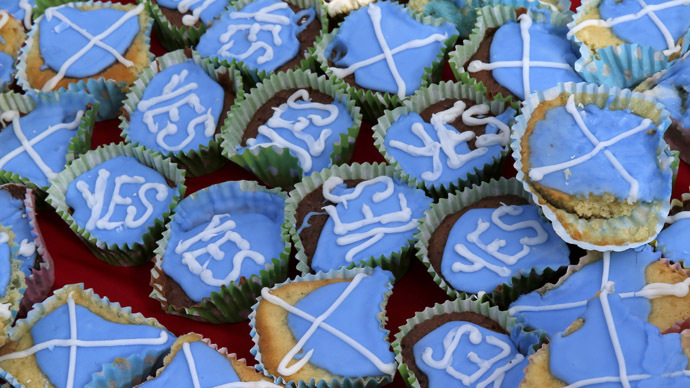 Professor John Robertson, of the University of the West of Scotland, published a detailed academic paper earlier this year showing widespread bias in the BBC’s coverage of the independence campaign. “The use of dubious evidence and sources, the tough interviewing of ‘Yes’ supporters and the passive interviewing of ‘No’ supporters and the demonizing of the First Minister, Alex Salmond,” were among some of Robertson’s observations.